One neat thing about using Pathfinder Pawns as Frostgrave miniatures is that they’re flat, and therefore easy to store. After raiding the Inner Sea Pawn Box for spellcasters and soldiers, I cracked open the NPC Codex Box and went through that one as well. While I was punching out interesting-looking pawns, I thought it would be fun to try to match them to specific types of Frostgrave soldier. I oriented it vertically to show the pawns better, but if you imagine it rotated 90 degrees counter-clockwise, the pawn slots are in the same order as they appear on the soldier table in the rulebook (left to right, top row first). Soldiers are followed by spellcasters, which occupy several slots. I rounded the pawns out with 4d20, a bunch of pawn bases, and two 3-foot tape measures. 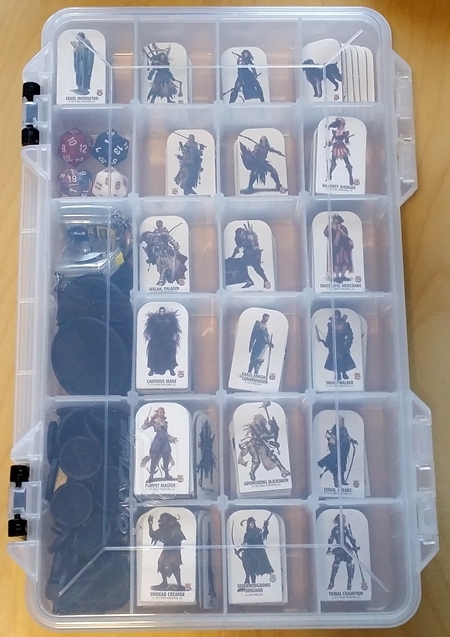 Close it up, and it makes a tidy package that fits neatly into my larger storage solution, a big plastic tub that holds everything I need to play except for the battle mat (which is too big to fit). Some soldiers are better matches than others, but I love the variety in the Pathfinder Pawns. 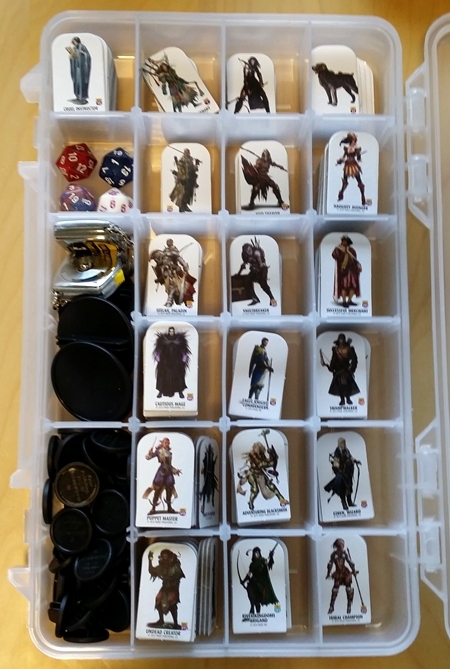 For this box, I chose only unique pawns — rather than every Viking-looking armored dude, for example, I just pulled one Viking-looking armored dude and included him with other unique pawns that fit that soldier type. I’m getting together with a friend to play Frostgrave next week, so I’ll get a chance to try out this sort-and-store method, Pathfinder Pawns in general, all of my nifty terrain, and — best of all — the game itself. Monsters are in a plastic baggie, because 1) there just aren’t that many of them, 2) they’re different sizes, and 3) I don’t think they’ll come up often enough to need to be pre-sorted, unlike soldiers and spellcasters. Here http://www.lamarcadeleste.com/search/label/Pathfinder you can see a heavy review from every pawn box, for your selection of minis. Thanks for the idea of frostgrave with PF paws. I’ll see how the pawns work in actual play, but so far they seem like a great option.